This is a ideally located, spacious 1-story home--1380 sq. ft--on a one block street, Marine Drive, straddling two bodies of water. 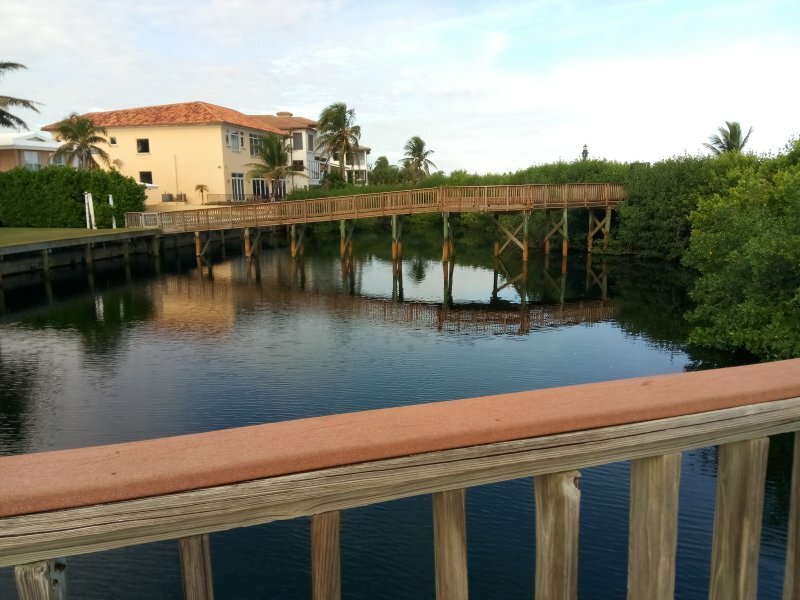 Across the street is a tropical-vegetation-lined path to a pond with a picturesque pedestrian bridge over it, leading to the beach. 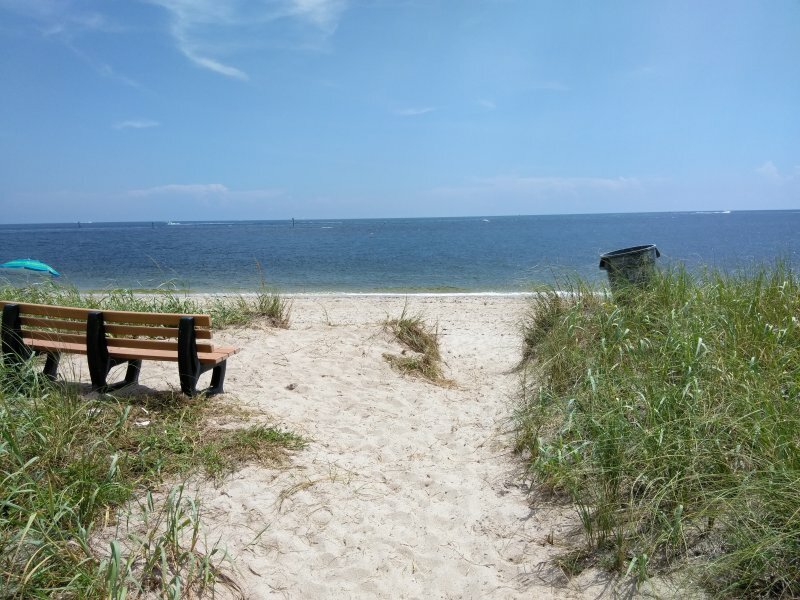 (see pictures) A short block down from the house is Marine Drive Park, with picnic tables and benches overlooking the Intercoastal Waterway, from where you can watch the boats go by.. and sunsets over the water. 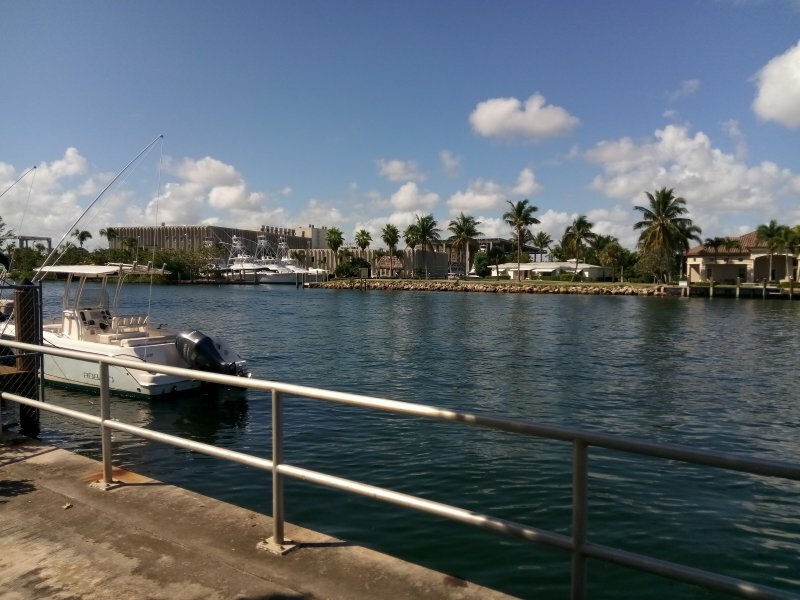 The home and street are quiet and private, yet right across the intercoastal is Whole Foods, Muvico Theaters, TJMAXX and the entire Pompano Center Mall with weekend farmers markets. Great sidewalks for walking or jogging. Go one way and you pass the gorgeous mansions along the intercoastal and beach front. Turn the other way and you go straight to the Seaside Bar and Grill, with Happy Hours overlooking the ocean. 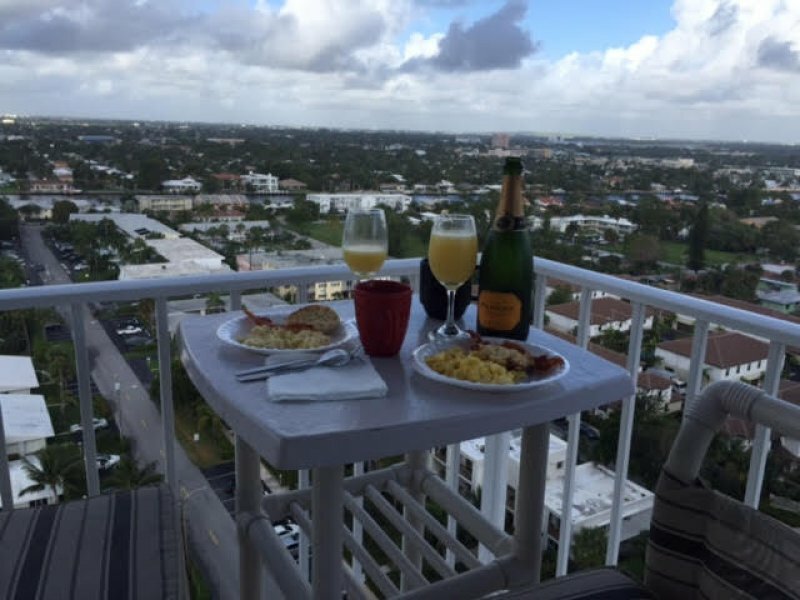 Farther down is the Pompano Beach boardwalk and center with plenty of sporting options, eateries and park. 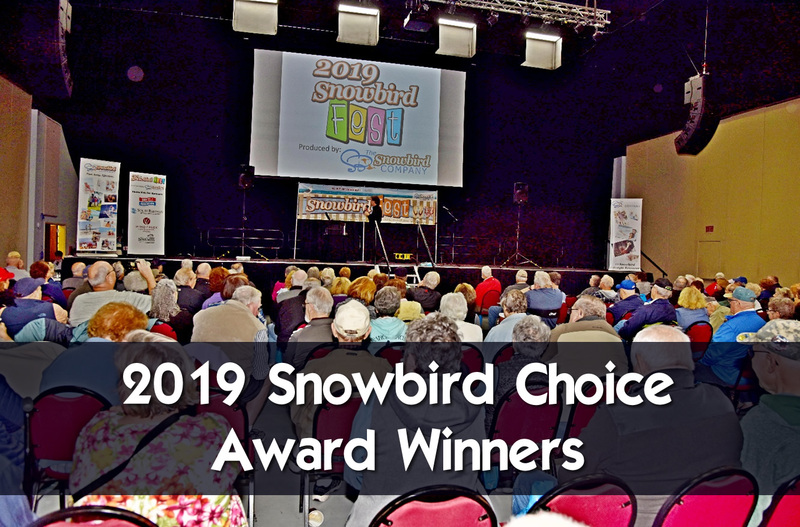 Town-sponsored outdoor concerts throughout the winter months (high season). 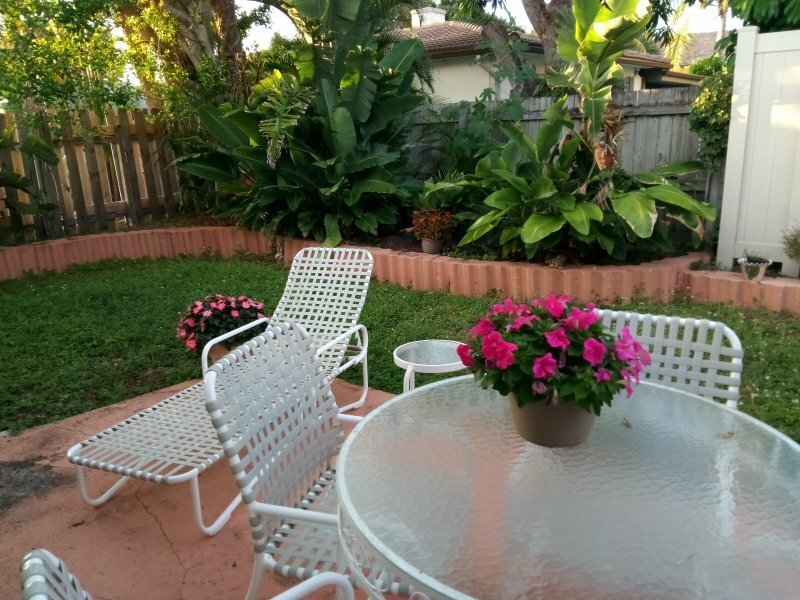 Bike paths all around, nearby health club with pool, public tennis courts, boat rentals, golf course, playground, and public Pompano Beach pool. 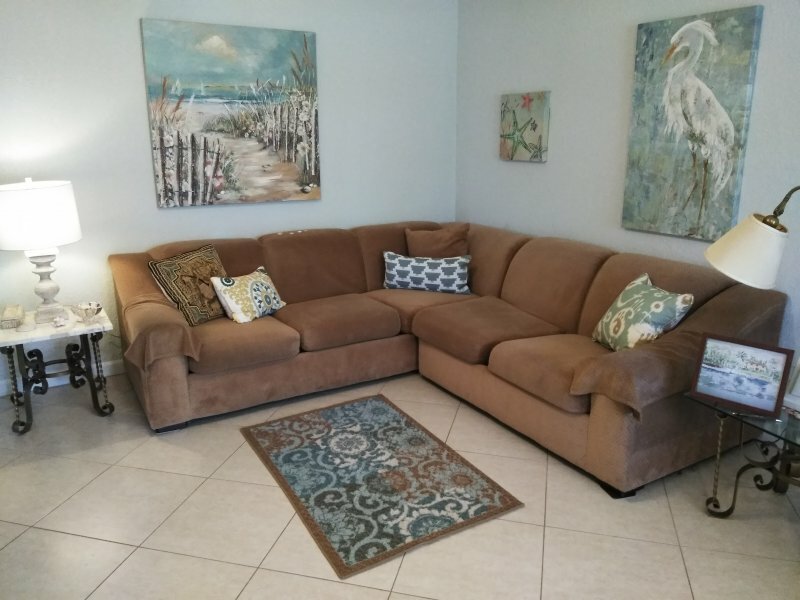 The 2 bedroom, 2 bathroom home includes an open living area, eat-in kitchen, and a large Florida room looking out onto a private backyard garden, complete with BBQ, chaise-lounge and outdoor seating area for 4. 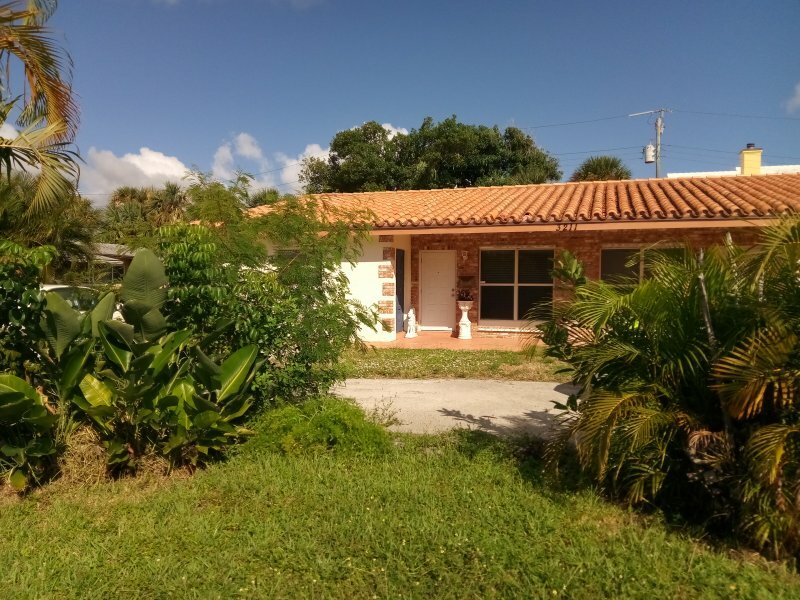 Tile floors throughout, granite countertops, all brand new impact windows. 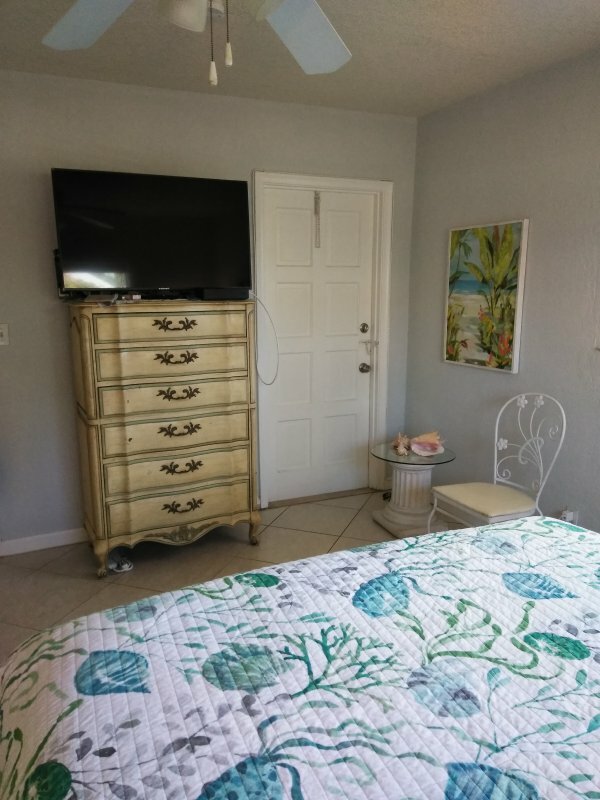 2 Flat screen TV's, one in one bedroom and one in the living room. Generous closet space and kitchen storage space. 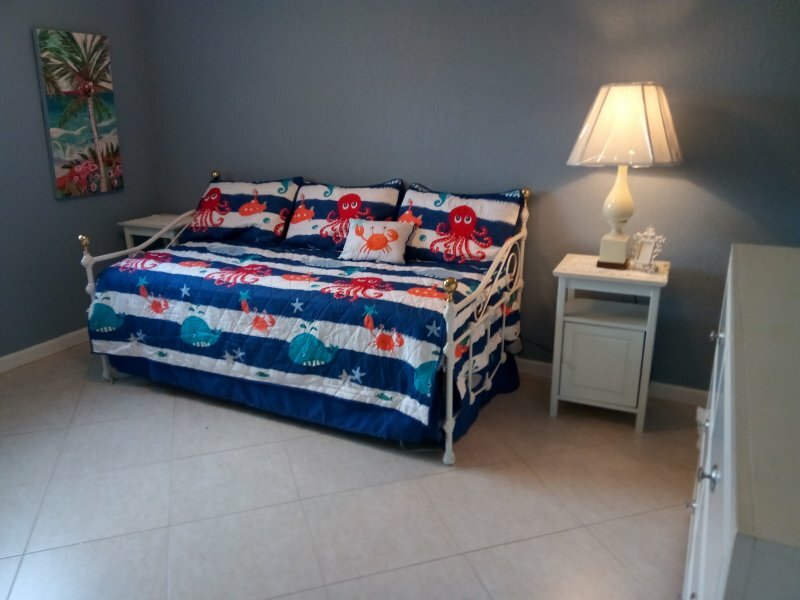 Comfortably sleeps 4, one bedroom has queen bed, other bedroom has a trundle bed, i.e. two singles. New mattresses. 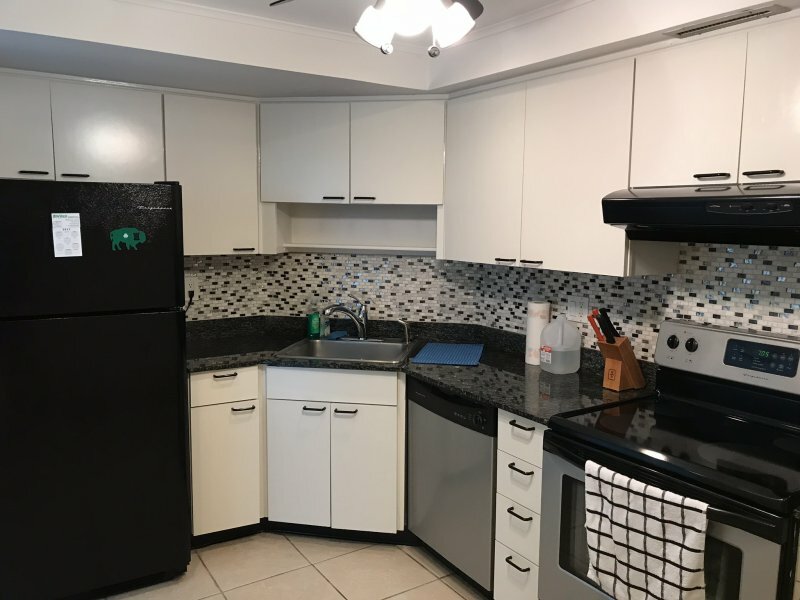 This is a fully stocked home with linens, towels, kitchen appliances both large and small, utensils and serving dishes. Turnkey. 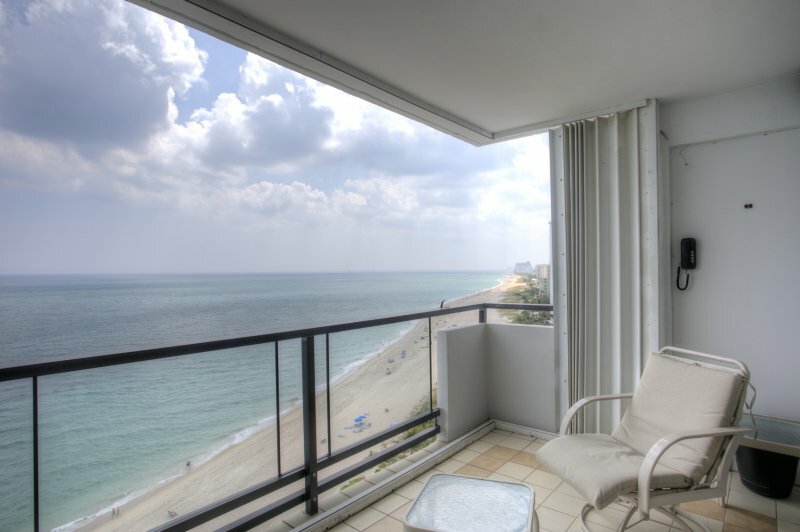 Come enjoy the beach, the weather, restaurants and cultural events in a comfortable, spacious, fully-equipped home. Parking for 2 cars. Internet and basic cable TV included. 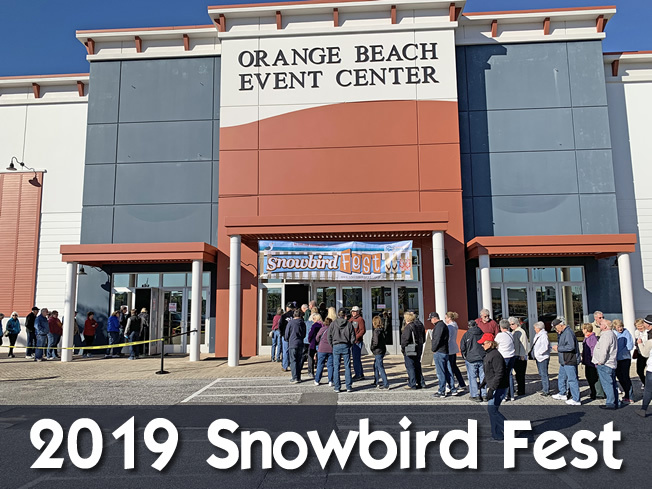 Perfect for snowbirds. Call 773-456-6557. 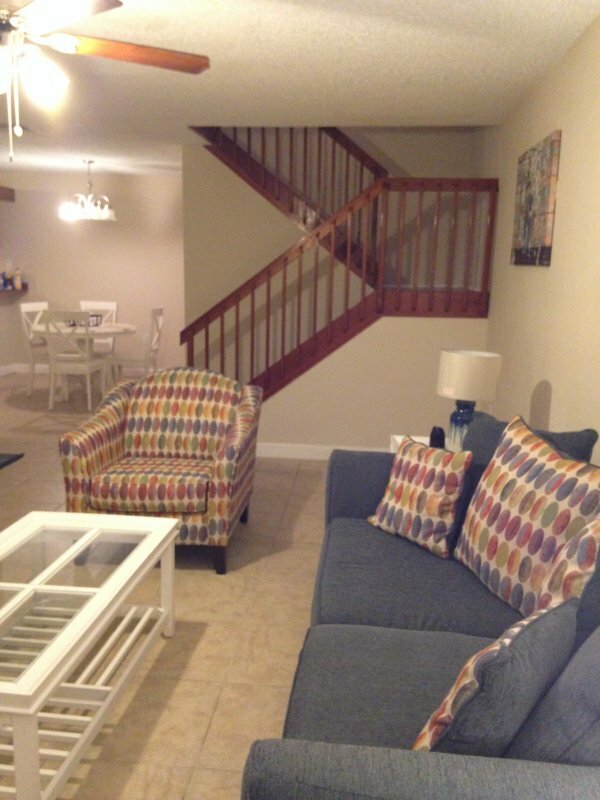 Description This is a ideally located, spacious 1-story home--1380 sq. ft--on a one block street, Marine Drive, straddling two bodies of water. 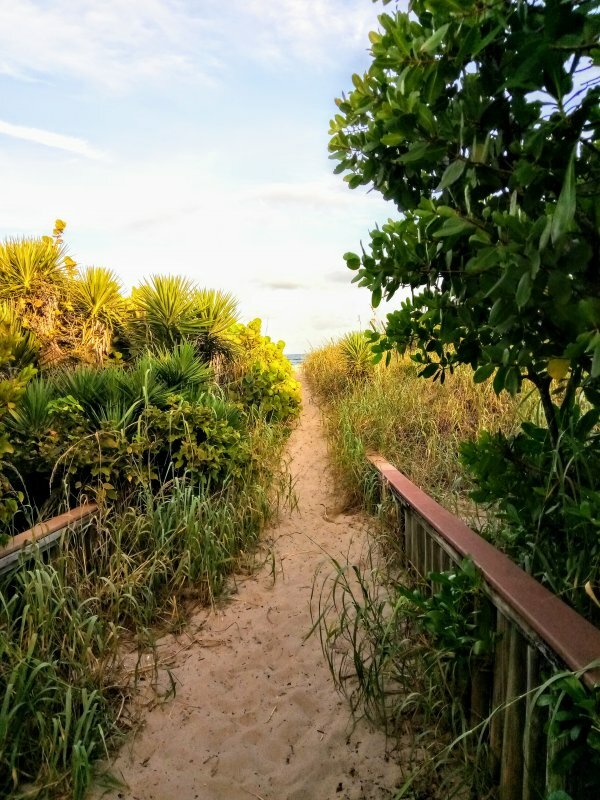 Across the street is a tropical-vegetation-lined path to a pond with a picturesque pedestrian bridge over it, leading to the beach. 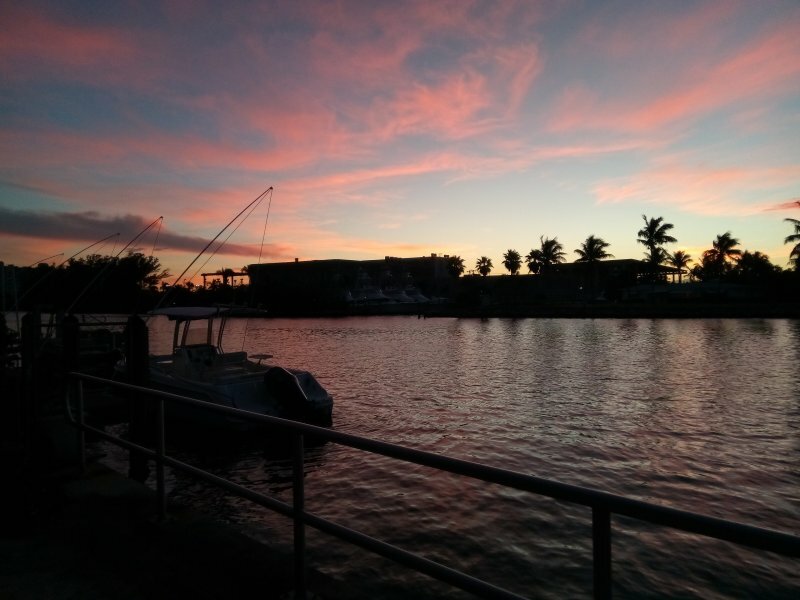 (see pictures) A short block down from the house is Marine Drive Park, with picnic tables and benches overlooking the Intercoastal Waterway, from where you can watch the boats go by.. and sunsets over the water. 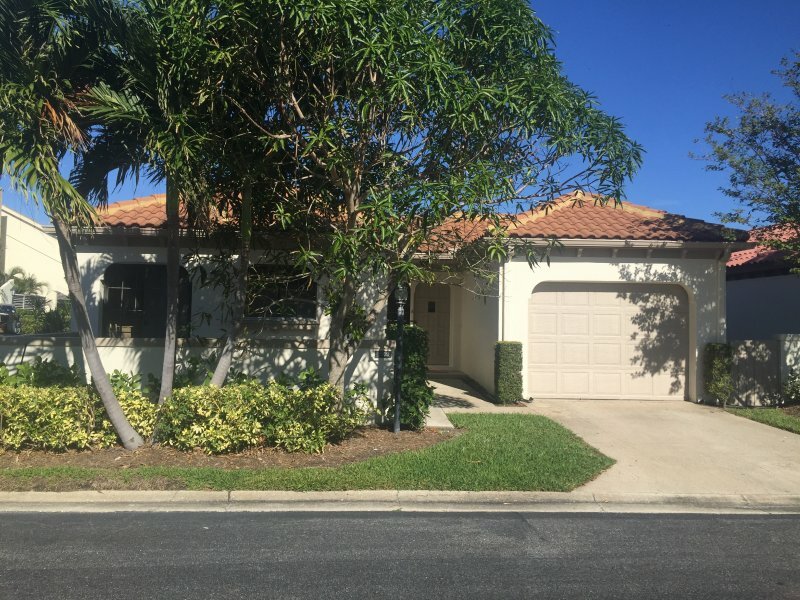 The home and street are quiet and private, yet right across the intercoastal is Whole Foods, Muvico Theaters, TJMAXX and the entire Pompano Center Mall with weekend farmers markets. Great sidewalks for walking or jogging. Go one way and you pass the gorgeous mansions along the intercoastal and beach front. Turn the other way and you go straight to the Seaside Bar and Grill, with Happy Hours overlooking the ocean. 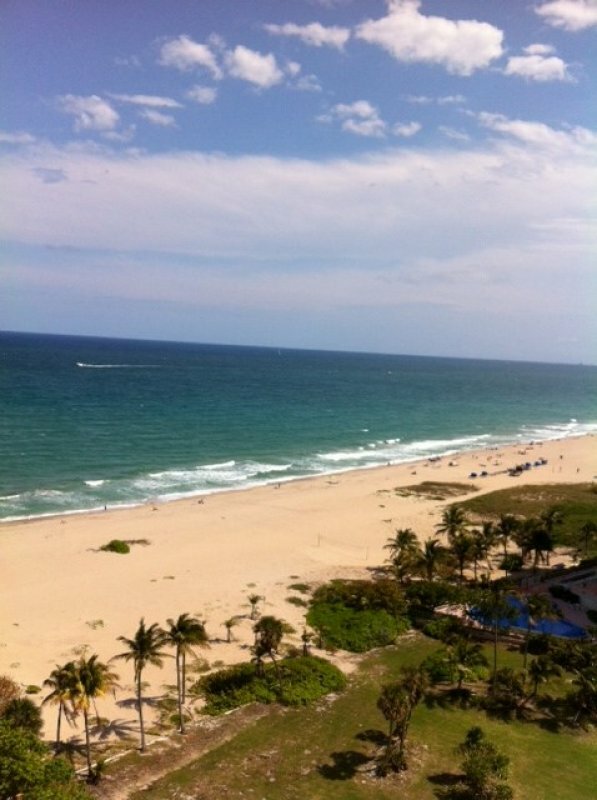 Farther down is the Pompano Beach boardwalk and center with plenty of sporting options, eateries and park. Town-sponsored outdoor concerts throughout the winter months (high season). 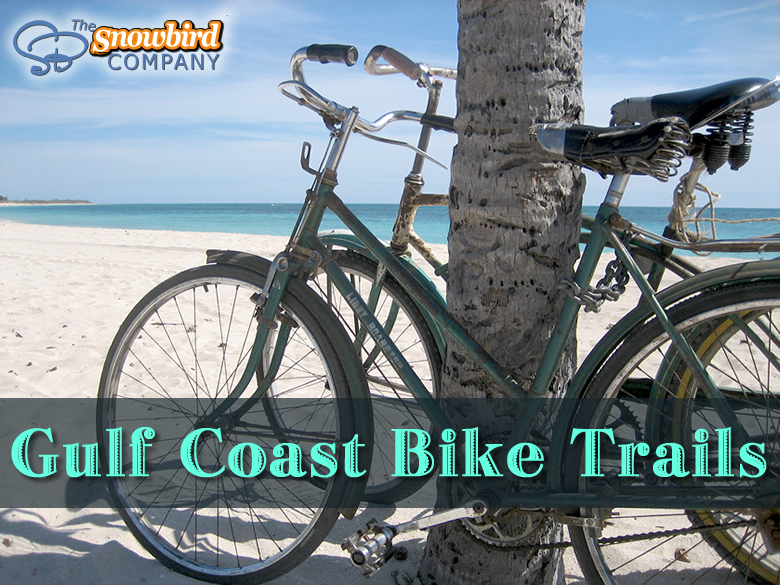 Bike paths all around, nearby health club with pool, public tennis courts, boat rentals, golf course, playground, and public Pompano Beach pool. 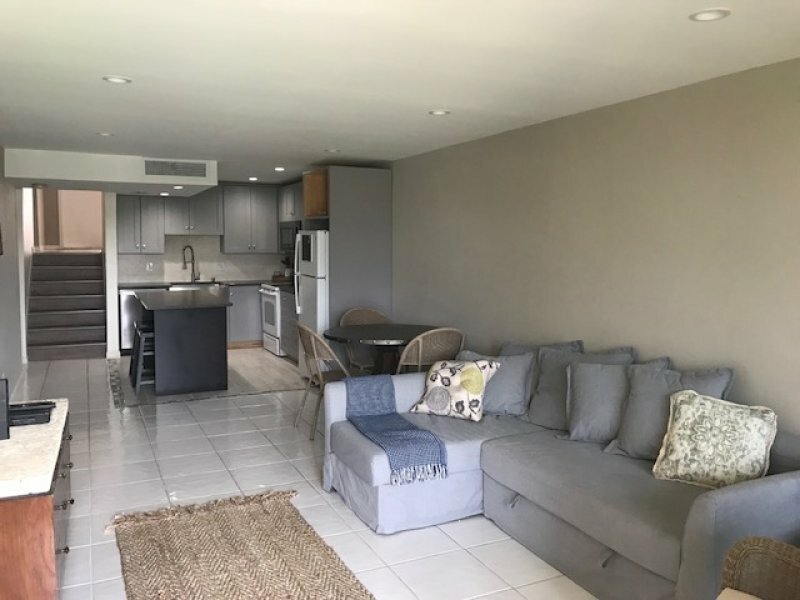 The 2 bedroom, 2 bathroom home includes an open living area, eat-in kitchen, and a large Florida room looking out onto a private backyard garden, complete with BBQ, chaise-lounge and outdoor seating area for 4. 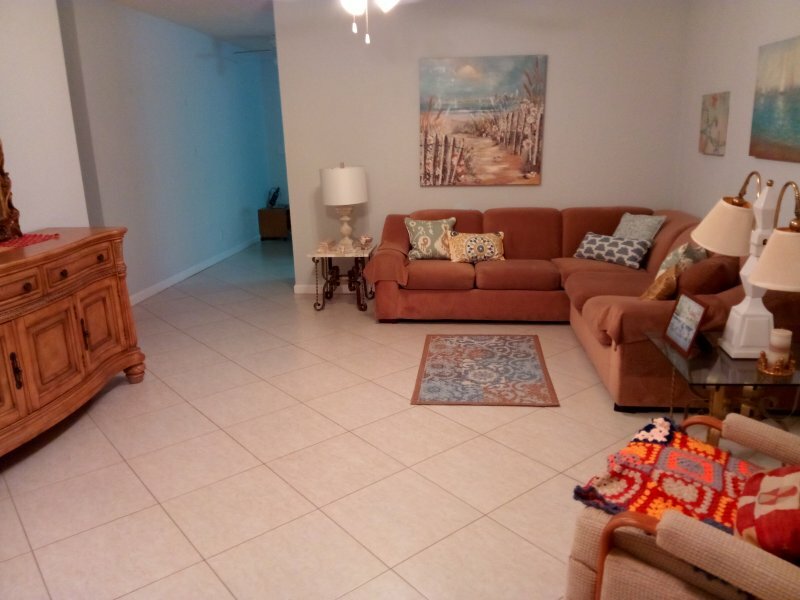 Tile floors throughout, granite countertops, all brand new impact windows. 2 Flat screen TV's, one in one bedroom and one in the living room. Generous closet space and kitchen storage space. 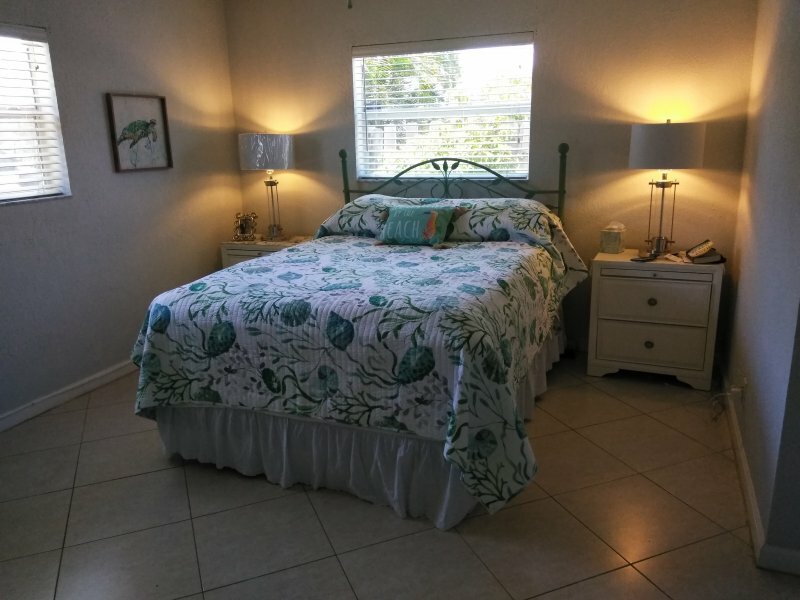 Comfortably sleeps 4, one bedroom has queen bed, other bedroom has a trundle bed, i.e. two singles. New mattresses. 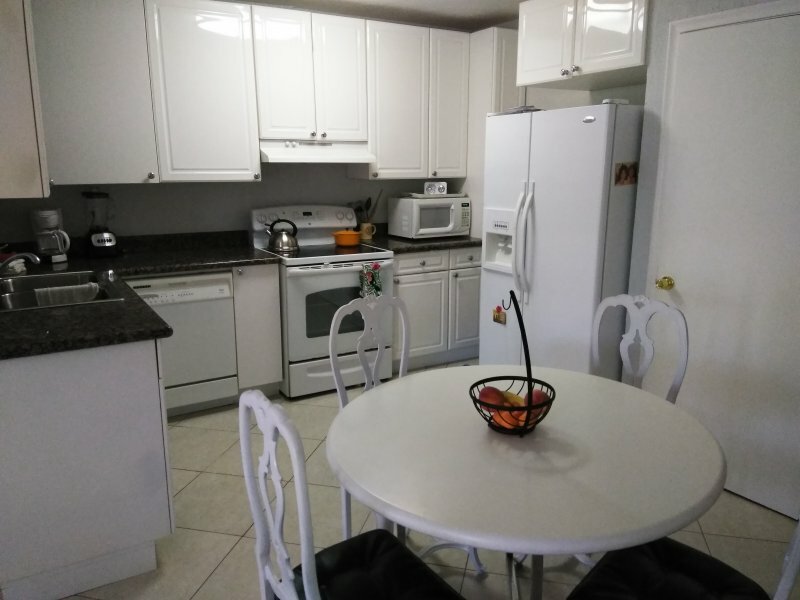 This is a fully stocked home with linens, towels, kitchen appliances both large and small, utensils and serving dishes. Turnkey. 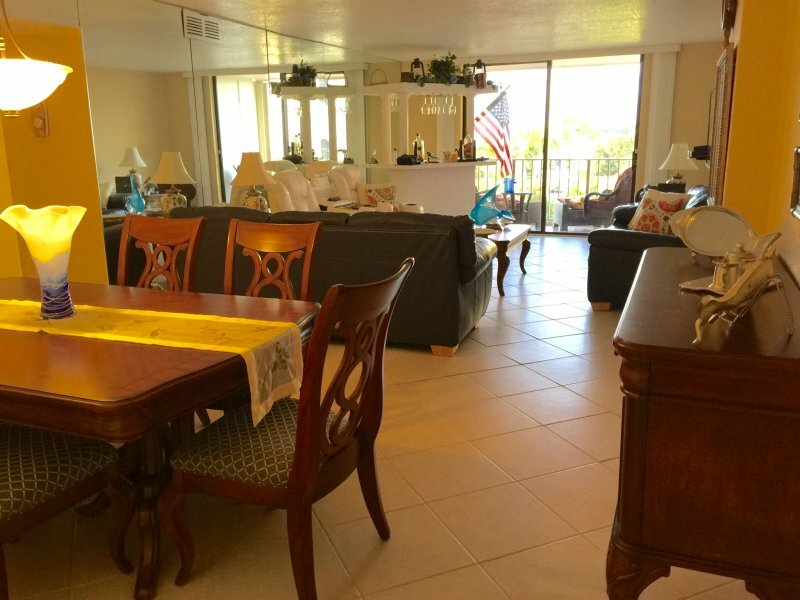 Come enjoy the beach, the weather, restaurants and cultural events in a comfortable, spacious, fully-equipped home. Parking for 2 cars. Internet and basic cable TV included. Perfect for snowbirds. Call 773-456-6557. Entertainment System 2 flat screen TV's. Basic cable internet.Private backyard garden, BBQ and table seating. AMC theater around the corner. Utilities Rent includes garbage pickup, water and internet service. Tenant pays electric. Landline available if desired. 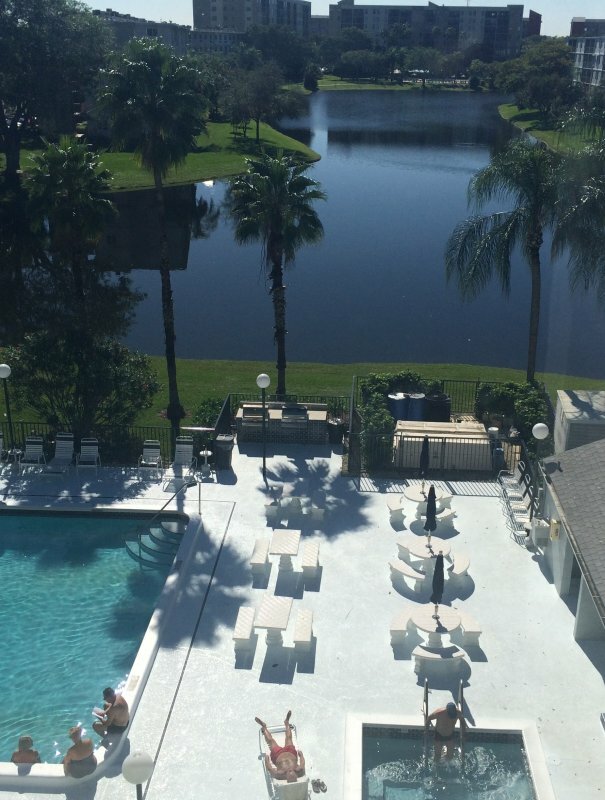 Additional Rate Information $3000 per month fully furnished in season, $2900 per month for a 6-month rental. $2500 per month for > 6 month rental. There is a boating club in walking distance that a guest could join, but I have never joined it and do not know what it offers. 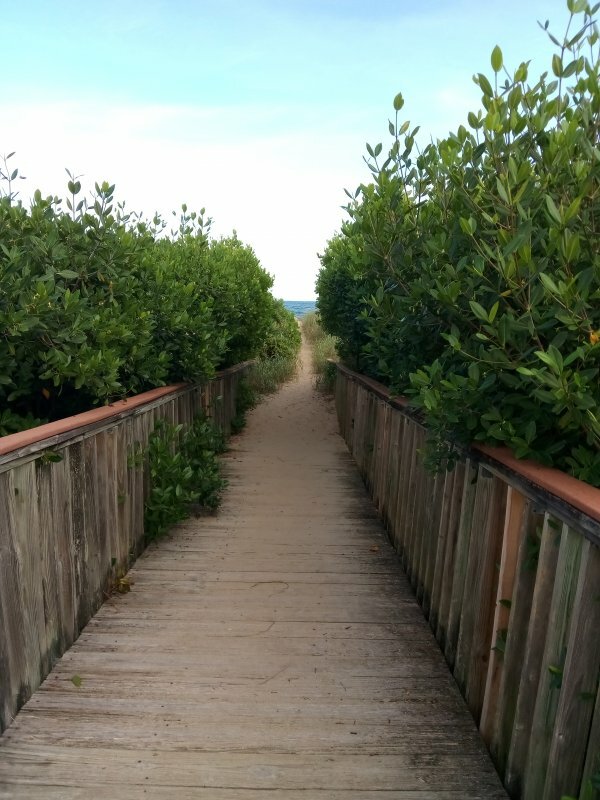 As a home, there is no ocean view, but the path across the street leading to the beach is quite lovely. Bordered by tropical vegetation and mangroves, it leads to a picturesque footbridge over a large natural pool of water. At the end of the bridge are the beach grasses and the entrance to the sandy beach. 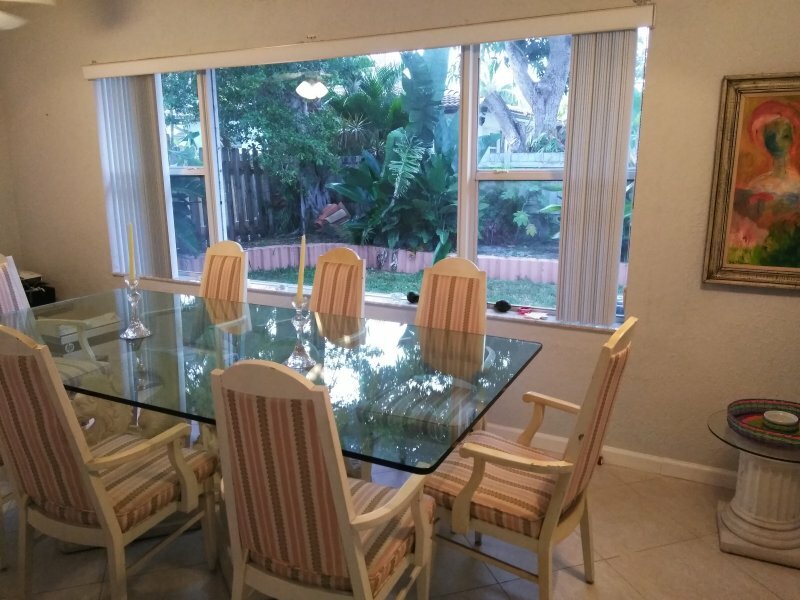 The back Florida room of the home has a large picture window which overlooks a private back yard with pretty greenery, large tropical trees. The garden is fenced in and the yard is completely private. The view is green and lush.